Like the mighty Phoenix, which despite the odds surrounding its existence, rose from the ashes to glory. The case of IPOB fully defines the saying, "from grass to grace." The Nigerian government, her backward media, decided to spread calumnies against the IPOB, so as they make their moves look questionable before the international communities. Little did they know that there are still people in the world, who despite the harsh economic situation haven't sold their souls and conscience to “brown envelopes” held high in the Nigerian system of government. 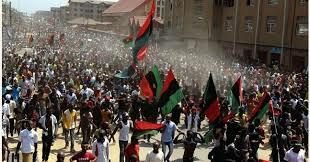 Under the watchful eyes of the southeastern leaders both political and traditional, even the so-called elders, the home of the IPOB leader Mazi Nnamdi Kanu, at Afaraukwu Ibeku was attacked by the Nigerian army under the code name “ python dance 2”, killing some security personnel there and whisked the IPOB leader away to an unknown destination. Yet these southeastern leaders didn't condemn the despicable act, led by General Buratai Tukur. The leaders didn't condemn this act because it was a communiqué they reached at Abuja after Nnamdi Kanu turned down their offer to jettison the IPOB quest. The southeastern governors, and the bacchanal political bigwigs who are hell-bent on stealing the people's mandates as well as their rights and properties for self-aggrandizement proscribed IPOB without a second thought. They and the Nigerian government decided to give the dog a name to enable them to hang it, by tagging “IPOB a terrorist organization”. The Nigerian government failed woefully again, as they forgot that we are the indigenous people of Biafra; the owners of the land of Biafra. Tagging IPOB a terrorist group was truly meant to keep the lid on the IPOB struggle. Unfortunately for them instead of constraining us, it gave us reasons to fight harder. They tagged the most prestigious organization in the world terrorist, yet we were allowed to open a new embassy in Germany by the German government who run a more sophisticated civilization than the damned contraption called Nigeria. They killed us, destroyed our properties, which they were supposed to protect. They encroached on our fundamental rights by making us undergo all manner of inhuman treatment both in their secret camps and public arena. They imprisoned most of us without trial in a law court of competent prerogative. All these were done to see that the Biafra ideology was killed, but instead of dancing to their tune, we created different music of our own, took the bull by the horn, took our destiny into our very hands. Rather than being relegated to the background, we blossomed like evergreen trees planted by the riverside, which will be vigorous, fresh and fruitful, even in old age. We have survived up until this time, and we are not showing any sign of compromise. We are more determined this time to do greater exploits. We will prove to the entire humanity that our amiable supreme leader, Mazi Nnamdi Kanu, has liberated us from the shackles of every manner of slavery. "WE MUST BE FREE", it is in our nature as 'Mma-nke-ndu.' We will always be there to prove that the IPOB struggle is divine.